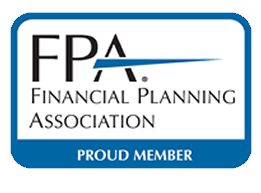 In light of recent market volatility and the near certainty of future market pullbacks, developing a framework for thinking about and investing through market declines can help investors achieve more positive outcomes. 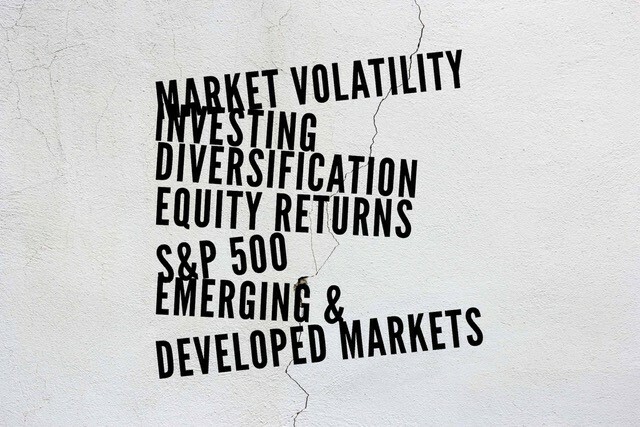 This article will provide perspective on historical U.S. equity market declines, present historical equity returns for various developed and emerging markets, and highlight the benefits of being a globally diversified investor. The last section will take you through a portfolio construction exercise that demonstrates how a portfolio’s expected risk and return profile changes after adding diversifying investments. 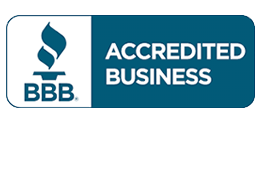 Benjamin Franklin once mentioned there were two certainties in this world: death and taxes. If he wasn’t preoccupied with the development of a new nation and had the foresight to predict the evolution of our financial markets, Mr. Franklin would have added stock market declines to the list. Since the end of 1945, the S&P 500 declined five to ten percent 77 times, which means a decline of this magnitude occurred at least once a year during this period. S&P 500 declines of 10% to 20% occurred 27 times or once every 2.67 years. Declines greater than 20% were less frequent but arose approximately once every ten years. Market pullbacks greater than 40% occurred three times, with an average decline of 51%. As investors, it is important to note the high frequency of 5%-10% declines. A year such as 2017 — which had historically low volatility — can give investors a false sense of security and tempt them to extrapolate calmer market conditions into the future. However, having this perspective on market declines helps investors realize a year like 2017 was unusual and higher market volatility is common. In the beginning of 2018, volatility came roaring back as investors worried about central bank actions, inflation, and geopolitical conflicts. Market re-pricing is common (anyone remember Brexit? ), and as discussed in an article titled U.S. Long-Term Asset Returns, higher levels of risk should be expected for historically higher-returning assets. Another key takeaway is the difference between the average times to recover from declines of lower magnitudes versus declines of higher magnitudes. Investors have historically recovered from S&P 500 market pullbacks of lower magnitudes in just a few months. The time to realize the full market decline and the time needed for a full recovery are very similar. In contrast, investors would have to wait almost six years to fully recover from a greater than 40% decline. The challenge facing investors is differentiating important market developments from noise. Since investors know this to be a daunting task, they should take advantage of investing’s only “free lunch”: diversification. Currently, the U.S. equity market is approximately 50% of the world’s market capitalization, which means U.S. stocks represent half of an investor’s opportunity set. For any Costco fans, ignoring international equities is analogous to walking through only half of the aisles at your local Costco and missing out on the samples. As awful as missing the samples is, investors with U.S.-only equity portfolios may point to globalization and U.S. firms deriving revenues from overseas as two factors that lessen the importance of global diversification. From a return standpoint, how have the two sides fared historically? Looking at Table 2, the U.S. market performed well in each time period. Over the past five years, only Japan, the Netherlands, Ireland, and Denmark had better performance. U.S. outperformance was especially noticeable during the ten-year time period. However, relative performance becomes more muted as the time period is increased to 25 years, 50 years, and 100 years. 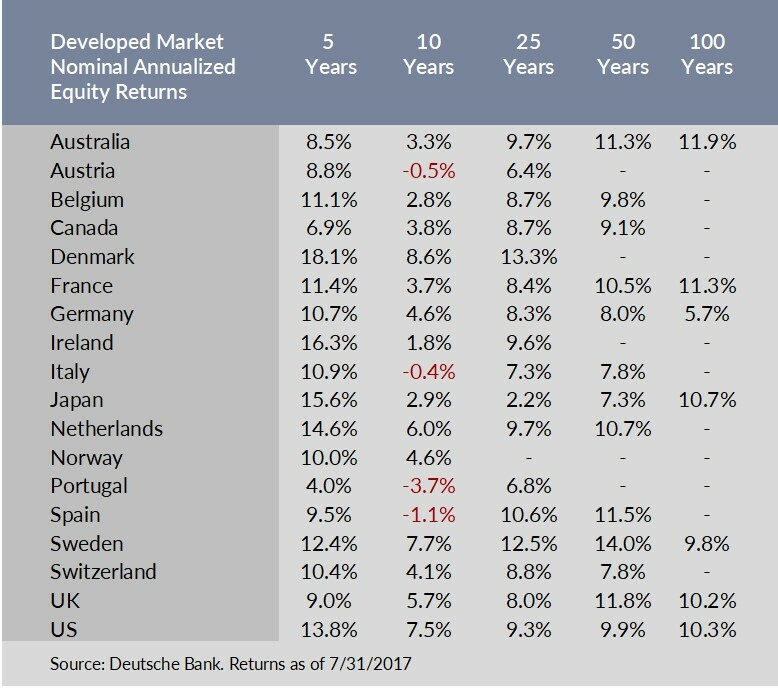 Apart from Japan’s 25-year annualized return, the long-term returns for each of the countries seem remarkably similar. As seen in Table 3, emerging markets performed similarly to their developed counterparts. India and Taiwan recorded strong returns during the last five years. 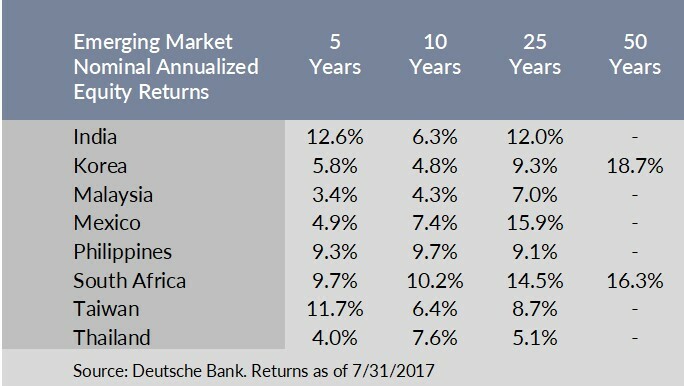 Ten-year and 25-year annualized returns of many emerging market countries were quite competitive relative to U.S. returns. Based on the historical return data and depending on country weights, a globally diversified portfolio would have provided similar returns to a U.S. only portfolio over the long term. With U.S. equity markets now seemingly rich relative to international markets, investors with U.S. heavy portfolios could stand to benefit from diversifying globally. Returns are only one part of the story. 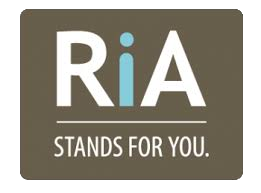 Risk is the other element investors must take into consideration, especially those nearing retirement or in the middle of retirement. As seen by the high frequency of large declines, the S&P 500 is quite volatile. How does the volatility of a U.S.-only equity portfolio change when international equities are included? What happens when bonds and other investments are added? To understand how adding diversifying investments changes a portfolio’s risk profile, four different portfolios have been constructed with each subsequent portfolio adding an additional diversifying element (Table 4). Portfolio volatilities were calculated using the historical volatilities of the indices and investments. Portfolio 1 consists solely of the S&P 500, which is a proxy for the U.S. market. Portfolio 2 represents the MSCI ACWI, a globally diversified equity index composed of U.S., international developed, and emerging market stocks. Portfolio 3 starts with the MSCI ACWI and adds a 5% allocation to Treasuries. Portfolio 4 adds a position to gold, often used as a hedge against inflation and fiat currency devaluations. Beginning with Portfolio 1, the annualized volatility of the S&P 500 is 18.67%. When international developed and emerging market equities are added (Portfolio 2), the portfolio volatility decreases to 14.84%. The decrease in volatility occurs because international equities are not perfectly correlated with U.S. equities. In Table 5, investors can see how each subsequent portfolio has a lower volatility after adding the additional investment. From Portfolio 1 to Portfolio 4, volatility was reduced by 27.4%. However, reduced portfolio risk does not necessarily mean a lower return. As stated previously, a globally diversified equity investor has not historically given up much return; yet, portfolio volatility can still go down even if the portfolio’s expected return stays the same or rises. The world is constantly evolving, and investors give their best guess on how certain events will affect asset prices. This translates into market volatility and the near certainty of market declines. You may hear on the news about the DJIA dropping hundreds of points or the S&P 500 swinging wildly, but the great part is investors do not have to ride that rollercoaster. The investment experience can be quite different when diversifying assets are incorporated into a portfolio, and potentially equally rewarding. Reid, Jim, Nick Burns, Sukanto Chanda, and Craig Nicol. 2017. “Long-Term Asset Return Study: The Next Financial Crisis.” Deutsche Bank Markets Research.